Though English is the primary language of Hawaii, the centuries-old Hawaiian language is still actively used. While you won’t need to learn Hawaiian for your vacation, I want to share some useful Hawaiian words and phrases to know for your trip. Aloha means hello, goodbye and love. You will generally hear it used as a greeting. Ohana means family. You might hear of restaurant meals served ohana-style, which would mean family-style. Keiki means child or children. You might see keiki menus or events and activities for keiki. E komo mai means welcome. Wahine means lady, female. Restrooms may be labeled wahine instead of women. Kane means man, male. Restrooms may be labeled kane instead of men. Ono has two different meanings — it’s a fish and it also means delicious. You definitely want to find the ono food. Incidentally, the ono fish is a delicious fish. Pau hana translates to end of the work day. Keep your eyes open for pau hana restaurant and bar specials, which are known on the mainland as happy hour specials. You can get some great bargains on appetizers and drinks for pau hana. Honu means Hawaiian green sea turtle. They are protected and you should not approach a honu in water or on a beach. Kapu means forbidden and/or keep out. See our post about kapu. Makai means towards the ocean or ocean side. You will see and hear directions using the word makai. Mauka means towards the mountain. You may see and hear directions using the word mauka. Pali means hill. You might hear that lava is flowing down the pali on Hawaii, the Big Island. Aina means the land. Hawaiian culture has always had a focus on taking care of the land. You might also see the word kama’aina which means local, usually long-time Hawaii resident. Local residents with valid identification are eligible for kama’aina discounts. A hui hou means until the next time we meet. Hana hou means one more time, encore. You might hear locals shouting hana hou at the end of a concert if they want to hear the musicians play more songs. Lanai means balcony, patio. Hawaii hotel rooms usually have lanais. See our post: What is a lanai? Note that Lana’i is an island near Maui. Kokua means help, assistance. You might see a sign asking for your kokua in keeping the beaches clean. Menehune are mythical and sometimes mischievous small people who can build big structures almost magically overnight. Wiki means fast. At Honolulu Airport, you will see the Wiki Wiki bus that quickishly transports you between the main and the inter-island terminals. Pono means right or righteous. When you do something pono you’re doing the right thing morally. You might hear someone say the words malama pono to you as you are saying good bye. In that context, it means take care of yourself. As for how to pronounce these Hawaiian words and phrases, most consonants are pronounced excactly like we say on the US mainland. The only exception is that w is traditionally pronounced as a v-sound, though most Hawaii residents pronounce a w with the w-sound. Learning the Hawaiian vowel sounds can be a bit more tricky. Here’s our very basic guide to Hawaiian vowel pronunciation. Howzit is another way to say hello and/or how are you doing. Grindz means food. You might see good food described as ono grindz. Broke da mouth (also mouf or mout) means food that’s delicious. 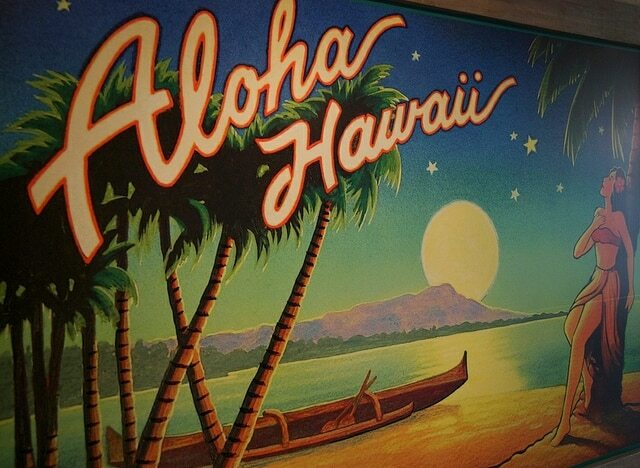 Learning these words will definitely help make your Hawaii vacation easier to navigate. For you seasoned Hawaii travelers, are there any other words you would add to this list? I totally agree, that it is essential to know a new language when traveling. I think that knowing the Hawaiian language when going there is a sign of respect and shows that you must be somewhat native to the land. I have one question though with the rise of Americans traveling to Hawaii for vacation, Does the Hawaiian island speak more English than Hawaiian? English is spoken far more than Hawaiian in Hawaii. You will hear mahalo, aloha, keki and ohana often. Pretty much that’s all though. I lived there for many years. Hi! I am going to be living in Hawaii for 3 years. Do you have any tips for a non local?? Local Kona girl told me, pau means pau. How about the tongue twisting Humuhumunukunuku apua’a ?